As you approach menopause you may notice memory lapses occurring more frequently than in previous years. Forgetfulness, difficulty recalling information given to you only moments before, and struggling to concentrate are all indicators that you're experiencing brain fogs, which is a common term for the memory lapses associated with menopause. Brain fogs are not only frustrating and distressing, they can also cause problems in a woman's personal relationships and professional life. 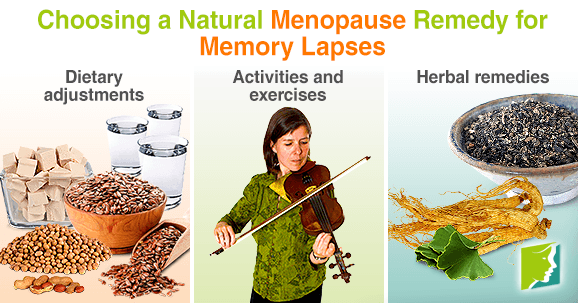 Like other menopause symptoms, memory lapses can be remedied with natural, effective treatments. It's easy to forget the role a healthy, balanced diet plays in boosting the mind as well as the body. The brain uses 20% of the body's fuel despite only taking up 3% of its mass. Eating regularly and nutritiously enhances cognitive functions that drive memory. Try to incorporate phytoestrogens into your diet. Memory lapses are caused by a decline in estrogen levels because estrogen increases blood flow to the brain and activates the neurotransmitters that control short-term memory. Eating plenty of soy products, nuts, and seeds will help to restore estrogen levels and sharpen the mind. Phytoestrogens are also rich in vitamin E, which is an antioxidant. Like all tissues in the body, the brain tissues are boosted by antioxidant activity. Staying hydrated is vital for enhancing memory. Your cognitive functions cannot work at their best when the brain's tissues are dehydrated. Try to drink 1.6 liters of water a day and avoid alcohol as much as possible. Alcohol not only dehydrates the body, it also dulls mental sharpness and inhibits the part of the brain that forms and processes new memories. Studies have found strong links between aerobic exercise and the reduction of memory lapses. Working out at moderate intensity - exercises like swimming, jogging, and dancing - for 30 minutes, five days a week will strengthen your cognitive functions as well as your physical aptitude. You should not limit your exercise to physical activities, however, as it is also important to stay mentally active with games and activities that stimulate your mind. Think of your memory as a muscle that needs to be strengthened. Do this by reading, learning a musical instrument, playing games that require mental engagement, such as Scrabble or cards, or downloading a fun brain-training app to use on your mobile device. When you sit down to enjoy a hot drink, make it a memory-enhancing herbal tea. You can used dried or fresh herbs, or purchase teabags from health stores and online retailers. Gingko and ginseng are often used in conjunction with one another to boost memory; studies have found the herbs increase blood flow to the brain, thus improving the way it processes, stores, and retrieves new information. Estrogenic herbs are also important during menopause. Concoctions or supplements based on black cohosh, Vitex Agnus-castus, and dong quai will regulate estrogen levels in the body and reduce the occurrence of resultant memory lapses. It's important to be patient and allow for these natural changes to enhance your memory and reduce the occurrence of brain fogs over time. In the meantime, you can minimize the impact of memory lapses on your life. Leave necessities (e.g., keys and purse) in the same place every day so you don't forget where you put them. At work, don't be afraid to take notes when you receive instructions to ensure you do not need to ask for the information again. For more information on memory lapses and how to treat them, follow the links below. During menopause and even postmenopause women can experience memory loss. For treatment advice check out the article.